I have evidence that my kids are turning into proper little European children. They like Nutella. More factually, the LOVE Nutella. Yesterday while I was frantically searching the grocery store for the Nutella stash, my sweet children were chanting Nutella, Nutella. Audrey says Tella, Tella. This morning I noticed it's grown into NEW-tella. NEW-tella. Whatever it is, it's adorable and it's another protein source which my almost vegetarian children need. Speaking of almost vegetarian, the kids are more than sustaining themselves on the wonderful salami here. Eva has requested it in her lunch each day and Audrey for lunch. She calls it lami, again so cute. More evidence: Yesterday after school Eva asked me what Je m'appelle means. Seems her French lessons are sticking! I told her what it meant and then we practiced the phrase with lots of different names. One of the parents at Eva's school struck up conversation with me while we were waiting for dismissal. Eva and her daughter are friends. I was so excited to be talking to another adult I almost ate her up. I think I may have scared her off. She is from England and they are here for 3 years. They are relatively new to Lux, as her daughter just started school in September. I was a second away from asking her to the house and to be my best friend when the bell rang announcing dismissal. I realized that from 8:30 am to 6:15pm each day I talk only to the girls. Mostly my 2 year old. No really, it's fine. I'm totally sane. Sleep update: Eva's school schedule has saved us all. Sleep is about 95% back to normal. That was a tough few days - thanks for listening to my whoas. My wonderful husband ordered me a cable cord for my camera from Amazon.co.uk. Turns out it is possible and I was just entering something wrong (shocking, I know) in the shipping section. It shipped yesterday! Yipee! The laundry lesson was a total bust. Think Assist forgot about me. Finally at 2:00pm someone showed me where the laundromat is. Didn't get any laundry done obviously. That is today's chore. Still have the post office to figure out. Tomorrow I think we're going to Bastogne as recommended by Catherine. Who doesn't LOVE Nutella? I always feel very guilty making my son a Nutella sandwich, though. It just seems like it should be saved for dessert. I'm glad you're all getting more, and better, rest. Doesn't it make a world of difference? We travel to Hungary (from the US) often, and it always takes a few days to get into the swing of things. Especially now with a little one. Tella, tella, tella... Seems like a song to me! Enjoy Bastogne, if you're not too cold don't miss "Australian homemade ice creams" - they are Belgian, actually, but quite good. I really glad to read that everything's more or less back to normal, and we must definitely meet! I grew up on Nutella. As a child I would lock myself into our pantry and try to eat a jar of it by myself. This was before you could buy the jars in the states (at least Alaska...where I'm from). My grandparents in Austria would send us it...I'm guessing my Mama wasn't too pleased that the Nutella disappeared. Hi, delurking to say hello and how much you made me laugh. Did you watch Friends? The one where Joey has an audition in French and asks Phoebe for help. She's teaching him how to say Je m'appelle Claude. Except it keeps coming out "je te flee bleuuu". Cracks me up every time. We love nutella. So much so, that I don't buy it anymore!! We eat it so fast. Is it hard to get Nutella in the US? I´m from Germany and I do not know anybody who doesn´t love it. 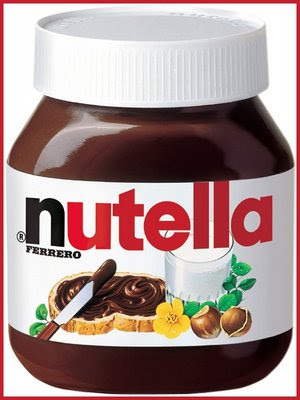 Many tried to copy it, but no other cream taste like the real Nutella. I can just picture Audie saying "Tella!" and Miss Evie trying out her french. Your blog helps me feel closer to you and the fam during this fun adventure. Tina, I don't have any trouble finding it. I'm in PA. Maybe it's not as readily available everywhere? "I realized that from 8:30 am to 6:15pm each day I talk only to the girls. Mostly my 2 year old. No really, it's fine. I'm totally sane." HILARIOUS!! I hear you. I so hear you. Nutella is amazing. Love it! Glad that all is working out for you. Best Wishes! I thoroughly enjoyed 'catching up' with you via your blog. Incredible! Yes, give yourself lots of time (up to six month according to some of us expat folks) to feel completely settled. Sounds like you are enjoying the journey so far. Brava! Your entries made me smile! You're doing great. "Ciao" to Bryce and the girls. I am so glad to hear you are adjusting well! I can't imagine surviving a new country with sleep deprivation. I can't wait for you to get your new cord, because I want to see photos of EVERYTHING! Nothing new to report here...weather has been nice, but I am ready for temps to drop and rain to come, as there is no snow in the mountains and I just got my Seasons pass to Stevens. Tomorrow we are going to celebrate Colby's 10th bday, mom and Orlo are giving him his Hawks ticket and I get to take him to his first Seahawks game, I just wish they were better...oh well, I am sure he will enjoy the experience. Shawna is still a loser...damn. :) Miss you dear!